Ten years ago this month, Hurricane Katrina made landfall in southeast Louisiana, leaving in its wake unprecedented devastation and an urgent need for health care. The storm and the levee failures left 1,577 people dead in Louisiana and another 238 people in Mississippi. Thousands more suffered direct physical health problems from the hurricane, while countless others were unable to access medical care or prescription drugs for pre-existing conditions. Untold numbers of people experienced severe mental health problems, including depression and post-traumatic stress disorder, which continue to linger years afterward. Tragically, the federal government’s health policy response failed to rise to the level of need in the Gulf Coast region. Although the Bush administration had approved a temporary Medicaid expansion after the 9/11 attacks to ensure that low-income survivors were covered, it rejected a similar approach after Katrina and maintained restrictive eligibility rules. As a result, thousands of uninsured evacuees who attempted to sign up for coverage were turned away in their moments of greatest need. Medicaid expansion through the Affordable Care Act, or ACA, however, rolled back these restrictive eligibility rules in most states and built a stronger health care safety net. Yet despite the potential for dramatically improved access to health care services during and after future natural disasters, the Gulf Coast states have thus far refused to expand Medicaid. Health care had long been out of reach for much of the population of the states directly in Hurricane Katrina’s path. At the time the hurricane hit, uninsured rates in those states were among the highest in the nation. Similarly, an annual public health survey ranked Mississippi and Louisiana the nation’s two least healthy states in 2004. Consequently, public health in these states was particularly vulnerable to disaster. A September 2005 survey of New Orleans evacuees in a Houston shelter documented the immediate health impacts of the storm. The surveyed evacuees were predominantly African American and low income, and 52 percent were uninsured. One-third of respondents reported having health problems or injuries as a direct result of the hurricane and flooding, with 41 percent describing these medical issues as “serious.” One in five respondents with hurricane-related health problems were not receiving care at the time of the survey. In addition to their new health problems, many of the evacuees had pre-existing health needs to manage, such as prenatal care for pregnant women or chronic health conditions for seniors. More than 40 percent were supposed to be taking prescription drugs, and one-third of all respondents had gone without the medications that they needed at some point since the storm. Similarly, an October 2005 survey of returned residents in New Orleans and neighboring Jefferson Parish found that more than half of all surveyed households had a member who had been sick or injured in the two months since the storm, and one-quarter of families had experienced difficulty accessing medical care or prescription drugs during that time. These struggles long outlasted the initial chaos following the storm and subsequent flooding, especially for those who remained displaced for a substantial length of time. Two years after Katrina, a survey of Federal Emergency Management Agency, or FEMA, trailer parks in Mississippi found continued worsening of physical and mental health. Adults surveyed were twice as likely to report being in “fair or poor” health as before the storm, and children were four times more likely than before. While the affected states had high uninsured rates long before Katrina, many previously insured people found themselves without coverage when businesses closed and jobs disappeared in the storm’s aftermath. In Louisiana, estimates suggest that as many as 200,000 people lost employer-based health coverage due to hurricanes Katrina or Rita, the latter of which hit the region shortly after Katrina in September 2005. Katrina also cut off residents’ access to health care by drastically reducing the availability of health care providers, as doctors evacuated and clinics flooded. In the New Orleans metro area, for example, the number of inpatient hospital beds dropped by more than half, and the number of operational safety net clinics dropped from 90 to 19. New Orleans’s Charity Hospital—which for centuries had been the city’s primary provider of health care services for uninsured and low-income people—was evacuated and shut down due to severe flooding; it never reopened, despite community objections. In addition to its effect on physical health, Hurricane Katrina left behind a devastating level of mental illness—especially depression and post-traumatic stress disorder, or PTSD. The survey of Orleans and Jefferson parishes in October 2005 included a PTSD assessment that found significant levels of emotional distress. Its results indicated that one-third of respondents were experiencing PTSD and likely needed mental health services, with up to one-half having a possible need for them. Despite this, fewer than 2 percent of households included someone who had actually accessed counseling or other mental health treatment in the two months since Katrina hit. Among people who remained displaced for years after the storm, rates of mental illness were even more elevated and longer lasting. In the previously mentioned 2007 survey of FEMA trailers in Mississippi, more than 70 percent of individuals attested to symptoms of depression, with almost 60 percent exhibiting signs of major depression. Furthermore, according to the researchers, “24 percent of respondents reported suicidal ideation, and 5 percent reported personal suicide attempts.” Few of the trailer park’s residents had access to mental health services; of those struggling with mental health issues, two-thirds had received no treatment or counseling since their evacuation. 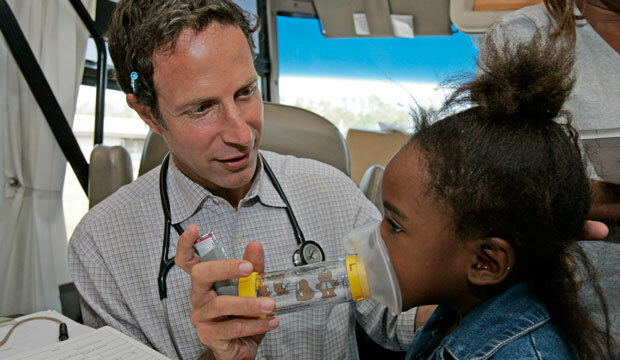 Children suffered the most intense and prolonged health effects from Hurricane Katrina. In February 2006, Columbia University researchers surveyed children in FEMA-supported housing across Louisiana and found that gaps in access to care during and after the storm had exacerbated the chronic health care conditions held by 40 percent of the children surveyed. For example, many children with asthma had been hospitalized for asthma attacks after the storm due to their parents’ inability to obtain inhalers or other asthma medication. One in five children who needed prescription drugs had not been able to take all of their medications—a rate that was 12 times higher than it was among Louisiana children before the storm. In addition to the difficulties presented by a parent’s loss of income or lack of health insurance, access to such medication was stymied by the loss of medical records or prescription histories, the inability to contact the child’s previous doctor, or the closure of local pharmacies. Overall, the surveyed parents were three times more likely than the general public to describe their children’s health as “fair or poor,” and 43 percent of parents described their children exhibiting behavioral changes or other symptoms of emotional distress. Post-traumatic stress disorder was widespread among children affected by Katrina, especially in the New Orleans metro area. A PTSD assessment of schoolchildren in four parishes in southeast Louisiana—including Orleans Parish—found that in the 2005-06 school year, 49 percent of students scored high enough on the assessment to need a referral to mental health services. Students were more likely to suffer from PTSD if they were still displaced from their homes, if they were separated from parents or caretakers, if they had evacuated to a shelter rather than to a relative’s home or a hotel, or if a family member or friend had been killed in the storm or flooding. Previous research after Hurricane Andrew in 1992 had found similar initial rates of PTSD and other forms of emotional distress among affected children but with rates dropping significantly after just a few months. Yet for children affected by Katrina, particularly those in the greater New Orleans area, the recovery from severe mental trauma came more slowly. In the Louisiana school study, 42 percent of students continued to exhibit symptoms of PTSD the following year. Notably, younger children were more likely to still be affected; 52 percent of students in grades 4 through 6 still suffered from PTSD in the second year, compared to 40 percent of students in grades 9 through 12. PTSD rates remained slightly above average four years after the storm, and a 2010 survey of the most heavily affected regions in Louisiana and Mississippi found that symptoms of serious emotional disturbance were still 4.5 times more common among children displaced by Katrina than among children from similar backgrounds in the rest of the country. Since much of the affected population was low income, Medicaid coverage played an important role in providing health care access after Hurricane Katrina—but only for those who could obtain it. Before Congress passed the ACA, income level alone was not enough to qualify people to enroll in Medicaid. Only low-income people who met strict eligibility rules—including certain people with disabilities, children, the elderly, pregnant women, or very low-income parents—were eligible for coverage. All other low-income individuals, particularly nondisabled adults without children, were ineligible. In addition to the limits on eligibility, the Medicaid enrollment process could be slow and required excessive documentation. These were considerable barriers for a displaced population that needed urgent care and often lacked access to the necessary records. Although Louisiana Medicaid officials were present at about 200 shelters to enroll uninsured evacuees, it quickly became apparent that the need for coverage dwarfed the program’s traditional eligibility. By early October 2005, low-income evacuees had filed almost 7,000 applications for Louisiana Medicaid coverage; yet 58 percent of these applications could not be approved, primarily due to the program’s nonincome-related eligibility restrictions. In addition to application rejections, one-fifth of people hoping to apply were told that they clearly did not fit any of the traditional eligibility categories and were discouraged from even filing their applications. The lack of broader Medicaid eligibility cut off thousands of uninsured refugees from access to health coverage, turning them away at their time of greatest vulnerability and medical need. In order to rapidly alleviate disaster refugees’ suffering, many policymakers looked to the example of the Disaster Relief Medicaid program that New York City and state governments set up in collaboration with the Bush administration after the 9/11 attacks. This was a temporary expansion of coverage for four months that allowed all low-income people in the disaster area to enroll in Medicaid via an abbreviated one-page application. Many health policy experts, including those at the Center for American Progress, urged the creation of a similar program for the Gulf Coast states in the aftermath of Katrina. With significant bipartisan support, Sens. Chuck Grassley (R-IA) and Max Baucus (D-MT) introduced legislation modeled after the New York program, suspending the additional eligibility requirements and offering at least 5 months and as many as 10 months of coverage to all low-income people in the disaster-affected areas. The proposed program would have been fully funded by the federal government in order to ease the strain on decimated state budgets. However, for ideological and budgetary reasons, the Bush administration rejected this approach and successfully limited the scope and cost of any Medicaid response by pressuring Republican members of Congress to abandon and block the bill. Although the administration did take steps to reimburse health providers for uncompensated care costs, it refused to change the existing eligibility rules, and as a result, the main barrier to coverage remained locked in place. Today in most states, the ACA has expanded Medicaid eligibility to all Americans earning less than 133 percent of the federal poverty level. This measure eliminates the primary barrier that blocked uninsured low-income people from gaining coverage after Hurricane Katrina. However, the U.S. Supreme Court’s ruling upholding the ACA in 2012 made Medicaid expansion optional for states rather than mandatory. Importantly, the cost of covering this group of newly eligible individuals is funded almost exclusively by the federal government; states do not contribute to coverage costs until 2016, when their share begins to gradually increase until it caps out at 10 percent in 2020. This measure allows states to expand coverage without overly burdening their budgets. Since the federal government has more budgetary flexibility during disasters than the affected states, this also improves the budgetary stability of the health care disaster relief response. Ten years after Hurricane Katrina, a new survey by The Henry J. Kaiser Family Foundation shows that while rates of mental illness in New Orleans have much improved, the city’s residents still face widespread difficulty accessing health care services and coverage. Although the percentage of respondents who are worried that “health care services might not be available if they need them” has dropped from 85 percent in 2006, it remains extremely high at 54 percent today. Similarly, many people report skipping medical care or prescribed drugs due to costs, especially among the uninsured. And while overall rates of mental health problems have returned to a more average level, many effects remain: For example, one-fifth of respondents have had difficulty sleeping that they attribute to Katrina-related stress. Notably, African Americans are more likely than whites to say that Katrina left them “less able to cope with stress,” reflecting the storm’s disparate impact on the city’s African American population. Underscoring these continued worries over health care access and affordability is the fact that all of the Gulf Coast states, despite their high uninsured rates, have refused to accept federal funds to expand Medicaid. Since the ACA went into full effect, Louisiana and Mississippi have seen their uninsured rates drop by 25 percent and 37 percent, respectively. By comparison, nearby Arkansas—which did expand Medicaid—cut its uninsured rate by 60 percent in less than two years. In addition to their high uninsured rates, the Gulf Coast states’ vulnerability to hurricanes accentuates their need for Medicaid expansion. Expanding health insurance coverage is not a cure-all; future disasters will always require specific, targeted health policy changes to provide immediate relief, as well as long-term supports—particularly to ensure access to mental health care in the following months and years. Nevertheless, Medicaid coverage alone can make a huge difference. For example, a study of a previous Medicaid expansion in Oregon showed that rates of depression dropped 30 percent among those who gained Medicaid coverage relative to those who did not. Medicaid expansion is a concrete step that would immediately improve health coverage and emergency preparedness today in these states, at little cost to their budgets. In Louisiana, Mississippi, and Alabama, about 450,000 uninsured people who are trapped in the so-called coverage gap would gain coverage under Medicaid expansion. A decade ago, Hurricane Katrina brutally exposed the holes in America’s flawed health care safety net. Today, the ACA has fundamentally transformed and improved the health care system. The national uninsured rate has dropped to a historic low, with nearly 16 million people gaining coverage since the ACA went into full effect. Yet along the Gulf Coast, political resistance has slowed down this long-overdue step forward. Having experienced the ravages of Katrina, these states know better than most the critical need for health care in the wake of disaster. The governors and legislators of the Gulf Coast states owe it to their people to expand Medicaid today. Thomas Huelskoetter is the Research Assistant for Health Policy at the Center for American Progress.